As one of the four principle basilicas of Rome and one of the seven pilgrim churches, Rome’s Cathedral of St. John, the Basilica of Our Divine Savior is dedicated to both St. John the Baptist and St. John the Evangelist. Its name is Basilica di San Giovanni in Laterano in Italian, and it was originally built by Constantine the Great in the fourth century as the first Christian church built in the city. The “Lateran” in the name refers to the site, which once was the location of the Laterani family palace which originally had been an ancient palace, part of his wife Fausta’s dowry. 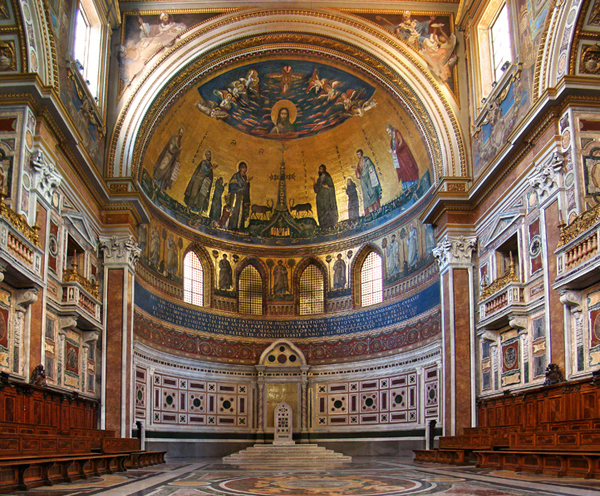 This is the oldest, and ranks first among the four great “patriarchal” basilicas of Rome. The site was, in ancient times, occupied by the palace of the family of the Laterani. A member of this family, P. Sextius Lateranus, was the first plebian to attain the rank of consul. In the time of Nero, another member of the family, Plautius Lateranus, at the time consul designatus was accused of conspiracy against the emperor, and his goods were confiscated. Juvenal mentions the palace, and speaks of it as being of some magnificence, “regiæ ædes Lateranorum”. Some few remains of the original buildings may still be traced in the city walls outside the Gate of St. John, and a large hall decorated with paintings was uncovered in the eighteenth century within the basilica itself, behind the Lancellotti Chapel. It was dedicated to the Saviour, “Basilica Salvatoris”, the dedication to St. John being of later date, and due to a Benedictine monastery of St. John the Baptist and St. John the Evangelist which adjoined the basilica and where members were charged at one period with the duty of maintaining the services in the church. There is also a commemoration in today’s Mass for St. Theodore, Martyr. He was a soldier martyr, and suffered death at Amasea in Asia Minor in 306. After being tortured by having his flesh torn by iron hooks, be was burned. During his martyrdom he sang the verse of the Psalm: “I will bless the Lord at all times.” At an early date a round church was built in his honor at Rome; pious women still carry their sick children thither in order to invoke the help of the great martyr. Terrible is this place: it is the house of God, and the gate of heaven; and shall be called the court of God. (Ps. 83: 2, 3) How lovely are Thy tabernacles, O Lord of hosts! my soul longeth and fainteth for the courts of the Lord. v. Glory be to the Father and to the Son and to the Holy Ghost, as it was in the beginning, is now and ever shall be, world without end. Amen. God, Who year by year dost renew the day of the consecration of this Thy holy temple, and dost ever bring us again in safety to the holy mysteries,hear the prayers of Thy people, and grant that whosoever entereth this temple to seek blessings may rejoice to obtain all that he seeketh. Through Jesus Christ, thy Son our Lord, Who liveth and reigneth with thee, in the unity of the Holy Ghost, ever one God, world without end. R. Amen. O God, Who surround and protect us with the glorious profession of blessed Theodore, Your Martyr, grant us to profit by imitating him and to rejoice in his intercession. Through Jesus Christ, thy Son our Lord, Who liveth and reigneth with thee, in the unity of the Holy Ghost, ever one God, world without end. R. Amen. Bow down to our prayers, O Lord, we beseech Thee that, while we pay our vows here below, we may, by Thine assistance, be worthy to attain unto everlasting rewards. Through Jesus Christ, thy Son our Lord, Who liveth and reigneth with thee, in the unity of the Holy Ghost, ever one God, world without end. R. Amen. Receive, O Lord, the prayers of the faithful with offerings of sacrifices,and, by the intercession of blessed Theodore, Thy martyr, may we pass through these offices of pious devotion to heavenly glory. Through Our Lord Jesus Christ: Who liveth and reigneth with Thee in the unity of the same Holy Ghost, one God Forever and ever. O God, Who from living and chosen stones dost prepare for Thy majesty an eternal dwelling, help Thy people who call upon Thee, so that what is profitable to Thy Church in material growth may be accompanied with an increase of that which is of the spirit. Through Jesus Christ, thy Son our Lord, Who liveth and reigneth with thee, in the unity of the Holy Ghost, ever one God, world without end. R. Amen. Grant us, we beseech Thee, O Lord, by the intercession of blessed Theodore,Thy martyr, that what we touch with our lips we may receive with pure hearts. Through Our Lord Jesus Christ: Who liveth and reigneth with Thee in the unity of the same Holy Ghost, one God Forever and ever. R.Amen.